.... when you get emails, texts, calls and yes, even real actual handwritten letters saying... "ARE YOU OK????" Or when you turn on the computer and every family member who walks in the room says, "Are you really writing a post???" Or when you see your blog on the screen and wonder who's page you are looking at. Or when there are 30 posts spinning around in your head and you can't decide which one to write first. Or when your kids say, "Mom, don't you think you should work on your blog?" It's not that I don't want to. I really do. I miss you all so very much. I think about you much of the time. But blog time, aka nap time, has been otherwise occupied with resting and sleep and all that good stuff. Blogging has also been hindered a bit by a dead computer. Allen gave me a new one and for most people that is an exciting prospect. However, figuring out Windows 8 has been a little more than a challenge for me. And then something went crazy with the software in my camera so we returned it and haven't found a replacement yet. The girls have no problem with me using their cameras but without having mine with me all the time I find I am taking far less photos than I normally do. The good news on my front is the last few weeks have been the best since September. I feel closer to myself than I have since I found out I was pregnant. While I don't think I will return to running anytime soon, (who am I kidding I can barely walk up the steps, right) and I still have to spend a lot of time resting, I feel like I am back in the game of life again. I feel like a normal, that is 32 week pregnant "normal" person. God has really given me a wonderful reprieve. I have been sleeping much better. My breathing has returned to normal. My sugar has leveled out to some degree. I have been able to be up and about almost every day. Ok, so I am more like an armchair parent right now. I sit in the center of everything and kind of direct more than do. I tire very easily but quite frankly that seems it should be expected after so many months of sickness and the fact that I am carrying around way more pounds than I am used to. Just the same, it feels good to be there or here or whereever after so many months of not. We've just about wrapped up our school for the year which is good with all that is about to happen around here. Several friends have been in to visit. It is so sweet to catch up with those we have missed for so long! In all my time sitting I have been working on hand quilting three projects I hope to wrap up before Henry arrives. And, on a particularly good day we even started to work on all those photos still hanging around from the flood. You remember that, don't you? It is a painstaking project but I actually think there may be a light at the end of the tunnel. The hardest part, trashing what was not salvageable, is finished. Those that were damaged but still had potential have all been scanned in. And now the girls are working on getting what was left behind into new albums. This flood and picture business does have a blessing side to it. I've been making albums for quite some time now and many are old styles no longer sold by Creative Memories. That means in order to find pages and page protectors to fit I've had to do a lot of searching on eBay. This has been a bit of a frustrating process. Since they are older styles, sellers label them as "vintage" and charge insane prices for things they wouldn't be able to sell otherwise. I found one package of pages selling for more than an album cover set. How ridiculous is that? Anyway, I digress. Imagine that! So, I had a very dear friend who I met when Brianna was a new born baby. She and I became very close over the years. She was much like a mother figure to me in that she had grown children almost my own age. But... she had a large family and had young children my kids age, too. We both shared the same values and ideals when it came to raising a family, but she had all the experience I lacked. Anyway, our girls took ballet together. We shared our love for home schooling. We took tap dance lessons together. Both of us had a love for sewing. And we often swapped "war" stories in the parenting trenches. 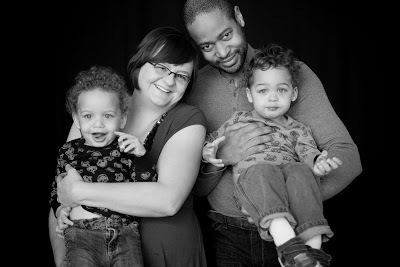 We both had a passion for photographing our families and journaling about the special moments of raising our children. She died quite suddenly three years ago. She was one of the dearest friends I have ever had and rarely does a day pass that I don't think of her. Even though neither of us had time for such endeavors, at the dawn of the scrapbook era, her niece got us both into making our memories into albums. Anita became a consultant so we could afford this new past time. Eventually, she grew it into a great business. Almost always our time together was spent working on, discussing and sharing our books. These days of digging through photos and working on albums made all those Wachters who knew Anita miss her all over again. It was very bittersweet to find some handwritten notes mixed in the mess of supplies and tools. So back to eBay. I was searching on eBay last weekend for some things we needed and I came across an auction by a seller whose name rang a familiar bell. I checked the location and had an inkling I knew just who it was. A quick email and sure enough it turns out to be my friend's oldest daughter. It was nice to exchange a few emails and catch up on her children and think of someone we both loved for a few minutes. And this must have been the week for old friends. Tuesday night we had a meeting with Allen's mentor and good friend from long ago. We've touched base now and again over the last 13 years or so but mostly with our busy life and his busy life, we just think of each other once and again. David was a very special person in Allen's life and the man I have to thank for my husband's ability to do just about anything useful there is to be done. We had a great dinner catching up on his family news, our family news, news of old friends and swapping chicken tales. The Lord willing we hope David will be overseeing our addition in the next few months. We also had the opportunity to have dinner and spend an evening with some new friends a few weeks ago. Well, really Julianne is like an old friend. We met her through blog world a number of years ago. There are so few young people today who live life so intentionally for the glory of the Lord. It has been a blessing to get to know her through her blog and through personal correspondence. We were delighted to know that she and that someone special in her life would be spending part of spring break here in Maryland. We had such a great evening getting to visit face to face and getting to know Brandon, that we barely even took a picture. But we sure hope they will be back soon and we won't make that same mistake twice! If it is possible, we enjoyed their thank you notes almost as much as our visit. Those gorgeous yellow flowers still look amazing, by the way. And, while it might still be a bit premature, a special note, dear Julianne... marry that man quick! Anyone who is willing to spend an entire evening with a houseful of kids he doesn't know and write a thank you note, too... well, that's rare and someone to be snatched up before he gets away. Samuel cornered Brandon into hearing all about his chickens and fighter planes. On the Henry front, things are coming along nicely. We are 32 weeks now. I am enormous! Which is funny since he has consistently measured 1/2 pound smaller than the average baby. That's a good thing for a diabetic baby. Our nurse shed a lot of light on the topic a few weeks ago when she announced the kid is sideways. And backwards. And what else would we expect from a baby who has done everything to make his presence known from day one? So in addition to all our other waiting and questions we are now waiting to see if this little fellow is actually going to spin himself around the right way. Go figure! Last Saturday we started having contractions. This is not particularly worrisome since I have had contractions from about 4 months on with all our babies, except Emma Rose. I spent many months on bed rest with two of the children and 3 were born prematurely. Actually, we were commenting on how unusual it was that I've not had contractions before now. He more than made up for it with an entire day and night of it. So I'm back to doing things that can be done only sitting or lying down. It's funny that you think, this is my 10th pregnancy. Surely, I have seen it all. Yet this little guy has managed to pull out all the stops to make sure we all know he is going to be different! Oh, and I think he is going to more than be rewarded for it. While I feel like a great big whale, everyone else around here keeps patting my abdomen and saying, "He is so cute!" Like really? How can you tell? Carmella has learned to say Henry and thinks every large tummy is him. Elisabeth has to kiss him goodnight and pat him good morning every day. And yesterday when we were doing our lessons he was completely covered with princess stickers. How do you suppose that happened? We are excitedly moving ahead and making preparations and looking forward to the day not so long from now when we will get to hug and kiss him face to face. I am just finishing up the binding on his quilt. With no place to put the crib, we are returning to the old bassinet that hasn't been used since Brianna was a baby. Kaitlin took scraps from his quilt and made it over. I must say, it was so beautiful I almost cried. Carmella loved it so much she wanted to climb in. Allen always prepares for a newborn with some big home improvement project that makes a huge mess and creates a lot of noise. When Nathaniel was on the way we bought this house... which we've been working on ever since. With Aedan he remodeled the master bedroom and bathroom. Then with Samuel the garage became a school room and nursery. When Ellie was expected he decided to gut and remodel the basement... which is almost finished. With Carmella came the remodel of the boys and girls rooms. And this week the builder came in to talk about the preliminaries to rip the roof off and add a second story. Yeah, a one or two room addition would be a lot easier. But why do things the easy way? Seriously, because of the well and septic locations, and the power lines and easements and right of ways, we can't build out from the existing house. Which leaves us with the option of going up or moving out. While the idea of moving and being done with the whole mess is tempting.... we love it here too much to actually do it. We hope to have a three way meeting with our architect and builder by the end of next week. Other updates... Please keep some these people in your prayers. *The family of baby C. At two weeks old his parents took him to the pediatrician because he was fussy. The doctor said he had reflux and sent them back home. He became fussier over the next few days. His parents, veterans with 2 older children, knew something was wrong and took him to the ER. The doctor there said he had a fracture in his leg and the child was taken away to a foster home. Assuming the parents were guilty of abuse, which I do not believe to be the case, authorities have done nothing to get medical care for this child. In fact, since being in foster care over the last 6 or more weeks, he has turned up with at least 2 more fractures. Their other children have been removed from the home and the parents are being charged. We are praying that this little boy would receive the medical care he needs, for the truth to come forward clearing the parents name and ultimately for this family to be restored. *Also, continue to pray for baby Taylor who has been in NICU since he was just a few days old. He came down with RSV almost immediately following birth. He seems to be making small improvements but is still on a ventilator full time, which may be causing problems as well. *And, pray for baby Jackson and his family. In just a few short days his family will be flying to China to bring him home after a very long wait. Woo Hoo! We pray for an easy adjustment for all of them, for heart strings to be quickly tied, for safe and smooth travels, and for any special care he will need upon arriving in the United States. While I have your attention... I'd like to tell you a bit about a long time very dear friend of Allen and mine. We all met when we were young adults. I was just finishing up high school and the fellows were beginning college. We have all been like family since. We have been through many joys and trials together, including extended family heart aches, weddings, divorces and babies. Being separated for long periods of time with half the world between us, we have still remained the closest of friends. In 1996, while serving in the Navy, Tony was diagnosed with MS and discharged from the military on a medical basis. We have watched him work hard to establish another career, maintain his health through careful diet and exercise and lead his wonderful family. This year Tony and his wife Carrie are raising money to help others with MS receive therapy and treatment and to spread awareness of this debilitating disease. Please consider popping over to their page and making a donation. Every little bit helps. Do it for me... please. 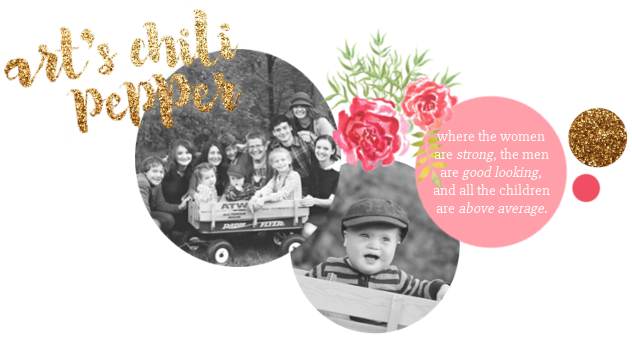 Let them know Art's Chili Pepper sent you and you will seriously encourage this very pregnant lady. And in other news... Samuel has lost his two front teeth in the last week. Here only one is missing but I love this photo of him. He looks so cute with his little gap. My boy is sure growing up quick! And we've had two feet of snow since the first week of March. Which is officially more snow than we've had all winter. Of course the yucky think about March snow is that you get a foot in the morning and by dinner time it is all mud. But it was pretty to look at while it lasted and the kids enjoyed taking those two days off school to sled. March in Maryland also means the rain. With the ground saturated it just rushes like no ones business. I wondered if the chickens might get carried away but they held their own. And on the topic of chickens... we had the queerest egg one day. It was so tiny.... more like a parakeet egg. Have you ever seen such a small egg? That's a baby feeding spoon. See how tiny? Of course, it became a home school project in which we measured and weighed and learned about finding volume with water displacement. What we couldn't seem to find out was why it was so tiny. If you know anything... do let me know. But regardless, it went into the omelets for breakfast and everyone was happy. Speaking of eggs, after many years of raising parakeets, our birds have successfully laid a clutch and we have enjoyed watching the chicks hatch and grow over the last week. They are so adorable in all their featherless ugliness. We are waiting for the last egg to hatch but in the meantime, our house is filled with the adorable peep of chicks... which is nice because at night it hides the squeak of the mice in our attic. Yes, they are still there. The exterminator has been in twice and is throwing everything he's got at the little pesks but they are fighting hard to hold their territory. The last few nights it seems they are less busy so perhaps they are finally getting the idea that they are supposed to die after they eat the poison? And on the pet front, this week Elisabeth got a new fish, named Bubble Gum. He died in less than a day. He was replaced with another beta named Lime. There is something incredibly hilarious about walking into a pet store with a girl all dressed in pink and asking to see all the pink fish in the joint. The sales guy seemed to enjoy it, too. And Emma's turtle digested his tank mate, a 6 or 7 inch Pleko. Yeah, we are seriously thinking we have created a monster. Emma has been telling all of us to stop overfeeding him but who knew how glutenous Zipper had really become? putting together favors for the guests. And the girls are literally counting down the hours until they can cut into the Easter pizza. With everything blooming, noses are running and eyes are itching, but that hasn't dampened the spirits of our little gardeners who are eagerly planning their vegetable boxes for spring. Even as I write, Allen and the boys are out there digging something up in preparation for the end of the frost season. So happy Easter to you, dear friends. Thank you for your prayers and well wishes. Don't forget to let us know what is up in your world and with all sincerity I will try to be better about keeping up with this poor blog and getting around to answering emails. But don't hold your breath! Ok, first of all - you look beautiful! And three - I have seen eggs that small before. Can't remember why they happen, but it does on occasion. I always love your comments! They are always so... responsive? Relevant? Is that the right word? I'm not sure exactly what it is I want to say but it's something. I always know a comment from you will be fun to read. I know I never got back to you about the nursing cover because I am SOOOOO behind in my email. But that is sweet of you and I do appreciate your thoughtfulness. Good to see you back in blog world, friend! Happy Easter to your sweet family! Not premature at all :) I only wish we lived closer so we could see each other more often! Since we visited, everytime Brandon sees something he thinks is interesting or a fun fact he says matter-of-factly, "Sam would like that!" So glad you got our notes! As always, you are a beautifully radiant pregnant momma - praying for you and Henry both. I absolutely love the quilt and bassinet redo! By the way, I love your pictures!